Not an easy task to explain clearly and briefly this ongoing project which started almost 10 years ago now. The idea came up while I was trying to reconstruct my family tree on the computer with my grand-mother helping me to fill up information and data she recalled from memory. She remembered lots of things, names, families, stories about our past and I wanted to contribute as well, so I began searching the internet… maybe it is possible to find some more information I told her. I realized that I was born in a very special place that seemed to have forgotten almost all of its history and complex community of foreign merchants that animated this port since the XVIth century. This place is named Livorno, or Leghorn as Englishmen used to call it. 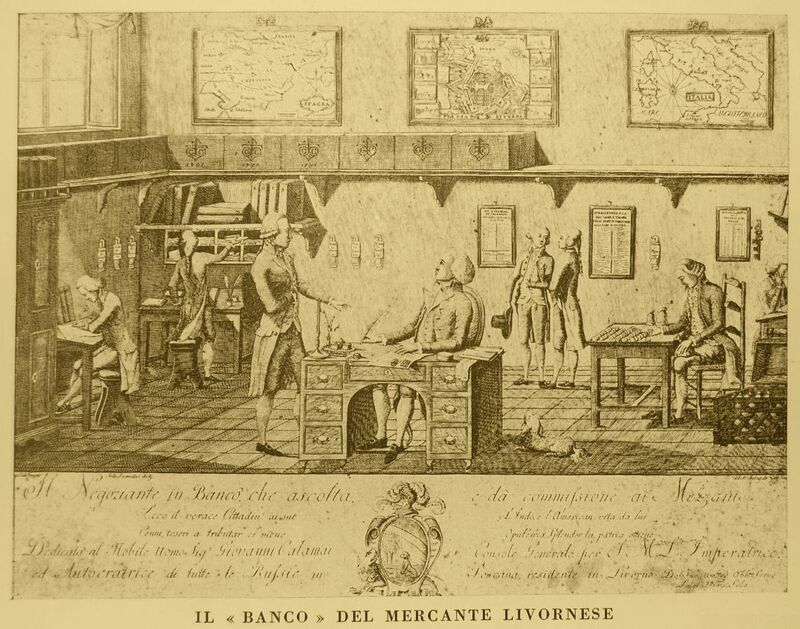 With meticulous research, the “secret” patterns linking families, towns, trades all over the Mediterranean and well beyond became more clear and they started to form a striking portrait of the strategies of our merchant forefathers. I followed these people through their family relations, their travels,their business contacts, their escapes from their countries looking for freedom of religion and freedom of commerce. I reconstructed their ancestors and their descendants discovering unsuspected relations which could be interpreted by historians to unveil the origins and consequences of their choices. A great part of these people are protestants, huguenots, walloons, anglicans, lutherans… and they built one of the most stunning merchant networks of history. Many were forced to flee from their countries during religious persecutions; they crossed borders, seas and mountains to find freedom and radically changed the history of commerce. The project is composed by a main genealogical database relying on the french Heredis software, a big library of documents including printed books, manuscripts, portraits, photographs, articles, a quite extensive e-mail archive with actual descendants of these merchants and an online database reflecting the basic structure of the merchant network without my research notes and sources which are kept reserved. The goal of all this would be to implement the database as an interactive instrument for historians and researchers who would also be able to edit the information thus making it more and more reliable day by day. For people needing genealogical information, graves’ pictures or a search on Livorno’s registers I am asking now a contribution for the project. Get in touch with me. Paypal Donation for Leghorn Merchant Networks Project. Good approach. Interesting genealogical read. Keep up the valiant effort. Your style of research is the only reason I am interested in my ancestors. It is much more interesting to discover different lives in different times than to find I am related to some famous sailor who lived in London! I am a “Walker” whose family came from Staffordshire, UK. I think they were always in the UK from ancient times, they were mainly poor workers in the wool trade and farmers. My grandparents sailed to New Zealand in 1905 with my father and his siblings. My father [Edward Alfred Walker] married and had me [Margaret Kable Walker], then came to live in Australia in 1958. It is slightly amusing that you are collecting lots of statistics on Walkers because my father was the New Zealand Government Statistician for a few years! I don’t think my Walkers are related to your merchants, but I will be very interested to read through the project details. Thank you for all you hard work!